Strike of 1899-1900 As reported by The Blossburg Advertiser December 1898 through December 1899. William B. Wilson worked closely as a friend and ally of UMWA president John Mitchell. 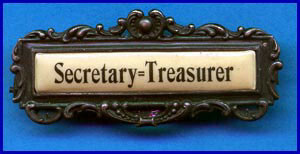 Soon after Wilson took the secretary-treasurer position in 1900, the UMWA organized a strike that included Tioga County. At this point, Mary Harris “Mother” Jones came to Arnot to assist in the strike. It is interesting to the researchers that three of our primary sources, Babson’s biography, Wilson’s manuscript, and Flashbacks, a brief history by Phyllis Swinsick of the southeastern section of Tioga County, do not overlap in their tellings of the strike of 1899-1900, despite its national and local significance. After months of terrible hardships the strike was about won. The mines were not working. The spirit of the men was splendid. [United Mine Workers District] President Wilson had come home from the western part of the state. I was staying at his home. The family had gone to bed. We sat up late talking over matters when there came a knock at the door. A very cautious knock.”Come in,” said Mr. Wilson. The strike, the longest in Tioga County history at eight months, was finally resolved in Feb. 1900 after a hard winter. When Wilson took charge of the treasury of the UMWA it contained $16,000 in poorly kept accounts. When he turned it over to his successor it contained over $1,027,000. By that time the UMWA had grow to have a membership of over 304,000. Through the UMWA, Wilson sought protection from injury for workers, a shocking concept at the time. Wilson believed, “If a person wants anything, he ought to be willing to pay for the cost of producing it, including the cost of the accidents to human beings.” He used this argument in 1901 at hearings before a Pennsylvania Senate committee, resulting in the first Pennsylvania worker’s compensation laws, which became a model for similar laws across the U.S.
Wilson also argued that corporations are fundamentally associations of capitalists who band together and hire collectively. He reasoned that workers should therefore also act collectively. “Any workmen who remain outside the terms of a collective bargain destroy the equality of the bargaining power to the extent of their numbers,” he wrote.